The accessory designer gives us yet another tough slew of bold, hand-crafted pieces. Fine jewelry, step aside. When we first saw the sculptural jewelry by accessory designer Michelline Syjuco, it was love at first sight. Well, love dashed with a bit of intimidation, that is. For those who are familiar with the work of this woman, you would know that her pieces are far from meek, far from classic, far from just pretty. They're big, brilliant, and brazen, sculpted individually by Michelline herself from her favorite medium, brass, which is given a luxe sheen by a few coats of gold. Pop one of her cuffs or rings on and your outfit has instant glam, and you'd immediately have a convo starter at any chi-chi affair. Michelline comes from a highly creative family, so it's no surprise that she loves to work with her hands. An encounter with a revered Filipino artist was just the encouragement she needed to launch her own artisanal accessory brand. "I knew I wanted to design jewelry the moment Napoleon Abueva (National Artist for Sculpture) praised a bracelet I created," she shares. "He actually encouraged me to continue and create my first collection." Since then, she has cultivated a distinct aesthetic for her bold jewelry. "I love to see a woman wearing big and bold jewelry because it shows just how confident she is. Many women shy away from statement pieces, and I find it refreshing to see a woman who isn't afraid to equate taste with daring." "My design aesthetic is definitely edgy and out of the box," she continues. "I am not formally trained in the art of jewelry making, so every step is trial and error. My techniques are definitely unconventional." One of the biggest selling points of her pieces is their uniqueness, as each cuff, ring, or pair of earrings is handmade by her. "It takes a lot of time and patience to put a collection together, but buyers can be sure that each piece is a unique work of art." This summer, she's presenting us some new pieces that are very much in keeping with the tough-girl accessorizing she's known for. "This season, I'm really excited to see bigger shapes and forms as well as bright colors, when it comes to jewelry." So she created a chunky selection of attention-grabbing pieces that would instantly add drama to any summer ensemble. "For this collection, especially with the rings in particular, I really wanted to play a lot with size. This collection features some of the biggest and boldest statement rings I've ever created, and I'm very happy with the outcome so far. 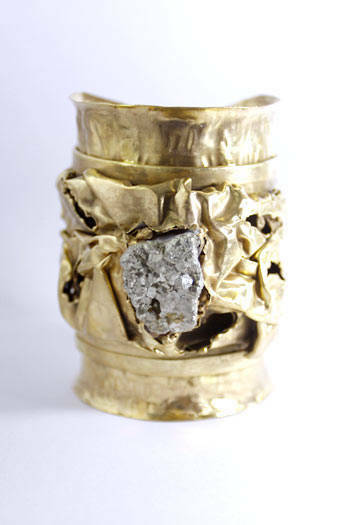 The materials used are primarily brass and silver, which are then dipped in gold. For the stones, I used an assortment of agate, jasper, pearls, and multicolored simulated stones." "If I had to pick a favorite piece from the collection," Michelline adds, "it would probably have to be one of my giant statement rings. Personally I think they're awesome." 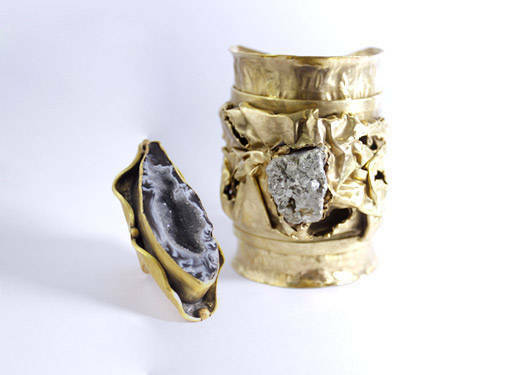 Indeed, if we had her jewelry box at our disposal, we'd have a field day ornamenting ourselves with her fun pieces. She tells us, "For me, the best thing about designing jewelry is that I never have a shortage of pieces to wear myself! I also find that it's very therapeutic, and a great way to express myself." Aside from this collection, there's more to look forward to from Michelline this 2012. "This year, I am looking forward to expanding my brand to Europe. My pieces have garnered interest from high-end boutiques in London, and this is something I'm very excited about." Click on the photo gallery to see Michelline Syjuco's latest designs. 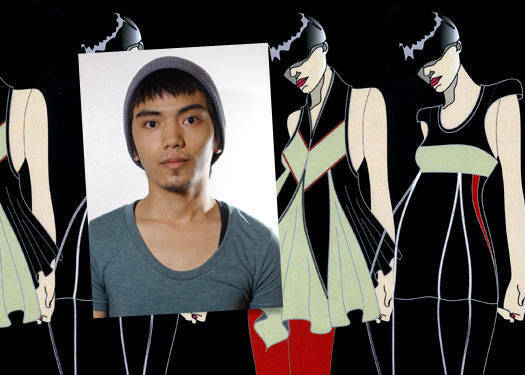 Click here for Michelline Syjuco's Designer Directory.